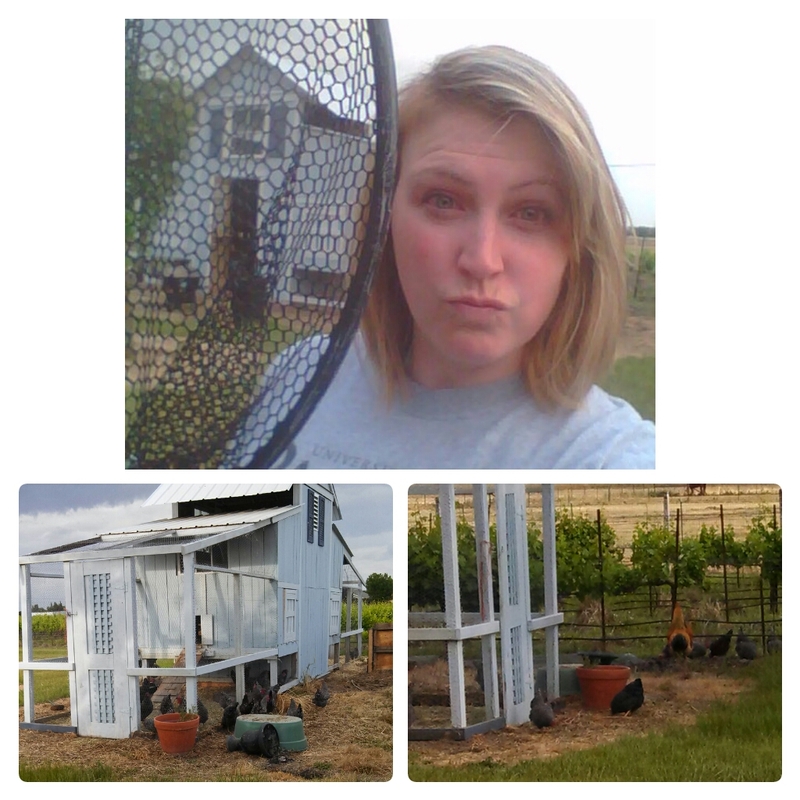 This Vine Life: "Here chickie chickie..."
I earned myself a new nickname a couple of weeks ago. For various reasons, LJ and I were left alone on the farm for a night. Before he left, JP reminded me that I would have to take care of all the farm chores in the morning. This included gathering the eggs and feeding the chickens and goats. I was not particularly happy about this, mainly because I forgot and LJ and I slept in a little, so we were running later than usual for a work day. But, we did it, and I mentally patted myself on the back for being such a good little farm wife and off we went to school/work. 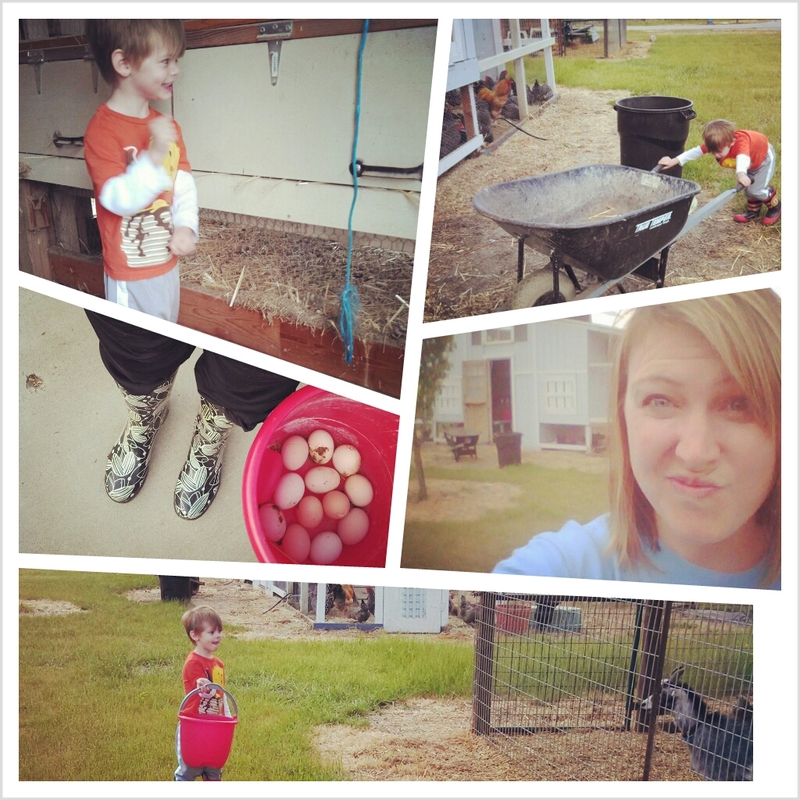 Doing our chores like good little farmers. LJ and I got home and started to go in the house. I looked over at the chicken coop and saw that there were several chickens OUTSIDE of the chicken coop. I kind of freaked out, possibly said a couple of adult euphemisms, and ushered LJ into the house so we could "gear up" for the capture. I guess I was being overly dramatic about it, because LJ started to cry about the escaped chickens. Once I dialed down the drama a few notches and convinced him that this was an exciting mission, I quickly changed into sweats and running shoes and we went outside to assess the situation and create a plan of attack. Altogether, 12 chickens had escaped, including the really big rooster. I told LJ he had to help me catch the rooster first. At that point he sank down to the ground and flat out refused to take part in the mission. I guess when you're only 40 inches tall, a big rooster is pretty intimidating. He did cheer me on from the sidelines for awhile though, only to disappear to the back yard or into the house to get himself a snack. Every now and then I'd have to abandon the chicken capture mission and go check on him. Surprisingly, the rooster was the easiest to catch. He didn't even put up a fight. The rest of the "girls" posed a huge challenge. Realizations: 1) Chickens are pretty fast runners 2) Chickens are smarter than they get credit for. They managed to find a lot of escape routes - as soon as they would see me coming they would run out into the vines where I wasn't agile enough to get to them quickly. Well played chickens, well played. After taking a header in the side yard and twisting my ankle pretty good, I finally figured out a way to outsmart them and was able to take them out one by one. Over an hour later, I got the last chicken back into the coop. It was a proud moment. This was my victorious, "I just OWNED you chickens" face. And that's the story of how I became known as the "Chicken Wrangler."